Mitochondrial dysfunction is a hallmark of aging, and underlies the development of many diseases. Cells maintain mitochondrial homeostasis through a number of pathways that remodel the mitochondrial proteome or alter mitochondrial content during times of stress or metabolic adaptation. Here, using yeast as a model system, we identify a new mitochondrial degradation system that remodels the mitochondrial proteome of aged cells. Unlike many common mitochondrial degradation pathways, this system selectively removes a subset of membrane proteins from the mitochondrial inner and outer membranes, while leaving the remainder of the organelle intact. Selective removal of preexisting proteins is achieved by sorting into a mitochondrial-derived compartment, or MDC, followed by release through mitochondrial fission and elimination by autophagy. Formation of MDCs requires the import receptors Tom70/71, and failure to form these structures exacerbates preexisting mitochondrial dysfunction, suggesting that the MDC pathway provides protection to mitochondria in times of stress. Our cells contain compartments called mitochondria, which provide energy and serve as a home for many metabolic pathways that are critical for life. Changes in mitochondrial activity can contribute to aging and to the development of several age-associated diseases. However, our cells contain systems that detect changes in the performance of mitochondria and can act to re-establish a healthy state. These systems respond to stress or changes in metabolism by degrading particular proteins in the mitochondria. This enables damaged or unwanted proteins to be replaced with new proteins, but it is not clear how these mitochondrial defense systems work to keep mitochondria healthy as an organism ages. Budding yeast is a good model in which to study the aging process because the performance of this yeast’s mitochondria change in a characteristic way as the yeast ages. Previous studies have shown that these changes are caused by alterations in another cell structure called the lysosome, which can store nutrients and is where many proteins are degraded. Here, Hughes et al. used yeast cells to investigate how mitochondrial defense systems operate during aging. The experiments reveal an entirely new mitochondrial protein degradation system that helps to keep the mitochondria healthy as the yeast cells age. This process is rapidly triggered by changes in lysosome activity and results in certain proteins in each mitochondrion being sorted into a small compartment made from a part of the mitochondrion. This compartment is released from the mitochondrion and then travels to the lysosome where the proteins are destroyed. Inhibiting the formation of these compartments results in mitochondria being more sensitive to cellular stress. The next steps following on from this work are to find out exactly what role this mitochondrial defense pathway plays in cells and why it targets only a small set of all the proteins found in mitochondria. Mitochondria play a central role in cellular metabolism. Metabolic pathways that occur within mitochondria include the TCA cycle, oxidative phosphorylation, amino acid metabolism, and biosynthesis of lipids, heme, and iron-sulfur clusters (Rutter and Hughes, 2015). Because so many vital processes take place within mitochondria, cells have evolved multiple mechanisms to maintain mitochondrial homeostasis under the diverse array of physiological states that a cell can exist in. These mechanisms are important for maintaining mitochondrial function during development, cellular specialization, aging and environmental challenges of nutrient availability or toxic stresses. Failure to maintain mitochondrial homeostasis under these conditions contributes to the development of numerous age-associated and metabolic disorders (Nunnari and Suomalainen, 2012). Many of the adaptive responses made by mitochondria are manifested through the composition and activity of the ~1000 mitochondrial proteins, which are regulated at multiple points from transcription to degradation (Bohovych et al., 2015; Fox, 2012). In the area of mitochondrial protein degradation, cells are equipped with numerous proteolytic pathways that function to maintain mitochondrial homeostasis (Anand et al., 2013). Some of these pathways target individual mitochondrial proteins, whereas others act more broadly and remove large portions of the organelle. Examples of the former include AAA+-ATPase proteases within all mitochondrial compartments that promote the degradation of unassembled protein complex subunits, oxidatively damaged proteins, and tail-anchored membrane proteins mistargeted to the mitochondrial outer membrane (Chen et al., 2014; Gerdes et al., 2012; Okreglak and Walter, 2014). There are also proteasome-dependent pathways that promote the turnover of proteins in the mitochondrial outer membrane and within internal mitochondrial compartments (Taylor and Rutter, 2011). The best-studied pathway for destruction of large portions of mitochondria is through selective autophagy, or mitophagy (Youle and Narendra, 2011). In metazoa, the PINK1/Parkin pathway serves as a paradigm of mitophagy (Pickrell and Youle, 2015). PINK1 is a mitochondrial-localized kinase that is rapidly turned over in healthy mitochondria, but becomes stabilized on the surface of mitochondria with a reduced mitochondrial membrane potential, or △Ψ (Narendra et al., 2010). Upon stabilization, PINK1 recruits the E3 ligase Parkin, which ubiquitinates a number of mitochondrial surface proteins to promote fragmentation and destruction of dysfunctional mitochondria in the lysosome by autophagy (Narendra et al., 2008). Importantly, all the general machinery of autophagy must be active for mitophagy to occur. The apparent specificity comes in tagging mitochondria for autophagy. The budding yeast, S. cerevisiae, contains no obvious sequence homologs of PINK1 and Parkin, but there are multiple reports of mitophagy occurring in yeast when cells are metabolically challenged or when △Ψ is compromised by genetic mutation or chemical treatment (Kanki et al., 2011). The most clearly defined version of mitophagy in budding yeast requires a mitochondrial outer membrane protein, Atg32, to link fragments of mitochondria to the autophagy machinery for degradation (Kanki et al., 2009b; Okamoto et al., 2009). Unlike the PINK1/Parkin pathway, the Atg32 pathway does not appear to respond to loss of △Ψ and does not utilize ubiquitin tagging for mitochondrial destruction. Instead, expression of Atg32 on the surface of mitochondria promotes turnover of mitochondria, primarily during times of regulated metabolic remodeling such as during the transition from robust growth to a starved or stationary phase-like state. In this regard, Atg32-dependent mitophagy may be a functional homologue to the tagging of mitochondria by the NIX protein during reticulocyte maturation (Novak et al., 2010). NIX is proposed to serve as a receptor on mitochondria to mediate mitophagy in this developmental process. More recently, a second mode of eliminating large portions of mitochondria was discovered in mammalian cells. It involves the formation of mitochondrial-derived vesicles (MDVs), which deliver oxidized mitochondrial proteins to the lysosome for degradation (Soubannier et al., 2012a). PINK1/Parkin are also needed for MDV formation and degradation, but interestingly the core autophagy machinery is not required (McLelland et al., 2014). This has led to the speculation that MDVs may provide an early wave of mitochondrial protein quality control, which if unsuccessful in re-achieving cellular homeostasis, is followed by 'full blown' mitophagy (Sugiura et al., 2014). A key area in which many of these pathways function to promote mitochondrial homeostasis is during the aging process. There has long been a strong association between cellular aging and mitochondrial dysfunction (Gonzalez-Freire et al., 2015). However, there is an incomplete understanding of how these degradation systems contribute to promoting mitochondrial health in aging organisms. While mutations in PINK1/Parkin lead to early onset of neurodegeneration (Kitada et al., 1998; Valente et al., 2004), it is not yet clear what events trigger this dependence on the PINK1/Parkin pathway during the aging process. In fact, much of what is known about mitophagy and MDVs is based primarily upon acute stresses placed on mitochondria by chemical challenges or severe genetic perturbations (e.g. treatments that cause global ROS damage or complete loss of △Ψ) (Sugiura et al., 2014). Replicative aging of S. cerevisiae, defined by the number of times an individual yeast cell produces a daughter cell, functions as a model system for understanding fundamental aspects of cellular aging, including age-dependent mitochondrial dysfunction (Breitenbach et al., 2014; Steinkraus et al., 2008; Wasko and Kaeberlein, 2014). We and others have shown that aged yeast cells have reduced △Ψ, decreased mitochondrial import, and altered mitochondrial morphology that transitions from a typical tubular shape to one that is highly fragmented and amorphous with increasing age (Hughes and Gottschling, 2012; Lam et al., 2011; McFaline-Figueroa et al., 2011; Scheckhuber et al., 2007). This change in mitochondrial structure and function is driven at least in part by changes in the pH of the yeast lysosome-like vacuole that occur earlier in the yeast cell’s age (Hughes and Gottschling, 2012), as well as asymmetric partitioning of healthy mitochondria to daughter cells (McFaline-Figueroa et al., 2011). In the present study, we followed the fate of these age-associated changes in mitochondria to further our understanding of how cells maintain mitochondrial homeostasis during the course of aging. As described here, our studies led to the discovery of a new mitochondrial protein degradation pathway that selectively remodels the mitochondrial proteome to maintain optimum mitochondrial function. As described above, autophagy systems play an important role in maintaining mitochondrial health across a variety of organisms. Therefore we tested whether autophagy played a role in maintaining mitochondrial function in aged yeast. Specifically, we examined aged cells for the presence of a mitochondrial outer membrane protein, Tom70-GFP, within vacuoles. No GFP signal was detected in the vacuole of wild-type cells across a wide range of ages (data not shown). However, vacuolar proteases rapidly degrade proteins taken up by autophagy and thus frequently prevent protein detection in the vacuole. Therefore, we re-assessed the presence of vacuolar Tom70-GFP in aged cells lacking PEP4, a gene encoding a master vacuolar protease that is required for turnover of autophagosomes in the vacuole (Klionsky et al., 1992; Takeshige et al., 1992). In young cells, which had functional mitochondria, no Tom70-GFP was detected in vacuoles by fluorescence microscopy (Figure 1A). However, vacuoles in 70% of aged cells contained Tom70-GFP (marked by white arrows in Figure 1A). Tom70-GFP in the vacuole appeared as a body exhibiting constant Brownian motion within the boundary of the vacuole membrane (data not shown), which is characteristic of autophagosomes that cannot be broken down in pep4△ cells (Takeshige et al., 1992). Mitochondrial proteins are degraded by autophagy in aged cells. (A) Tom70-GFP is degraded in the vacuole by autophagy in middle-aged cells. Wild-type (WT) and the indicated mutant cells expressing Tom70-GFP and the vacuole marker Vph1-mCherry were aged and visualized by fluorescence microscopy. Images depict wild-type cells, and the presence of Tom70-GFP in the vacuole (white arrow) of young, middle-aged, and old cells was scored for each strain. All strains including wild type are PEP4-deficient (pep4△). N = 30. In all figures, young cells have undergone 0–3 divisions, middle-aged cells 7–12 divisions, and old cells >17 divisions. Divisions are scored by counting bud scars visualized with calcolfuor (Calc). (B) Representative images of old ATG5- (atg5△) and DNM1-deficient (dnm1△) cells from (A) with fragmented vacuole morphology. To test if the appearance of Tom70-GFP within the vacuole was autophagy-dependent, Tom70-GFP localization was examined in aged cells lacking ATG5, a gene essential for all forms of autophagy (Feng et al., 2014). Aged atg5△ pep4△ cells contained no Tom70-GFP in the vacuole, which indicated that Tom70-GFP normally entered the vacuole via autophagy (Figure 1A). In addition to the core autophagy machinery, some forms of mitochondrial autophagy require the mitochondrial fission machinery (Muller et al., 2015). Delivery of Tom70-GFP to the vacuole in aged cells also required the mitochondrial fission machinery, as this process was inhibited in cells lacking DNM1, which encodes a conserved GTPase required for mitochondrial fission (Figure 1A) (Bleazard et al., 1999). Lastly, starvation-induced mitophagy in yeast relies on Atg32, a receptor on the mitochondrial surface that links mitochondria to the autophagy machinery for degradation (Kanki et al., 2009b; Okamoto et al., 2009). However, Tom70 degradation in aged cells is independent of Atg32; aged cells lacking ATG32 delivered Tom70-GFP to the vacuole at the same level as in wild-type cells (Figure 1A). 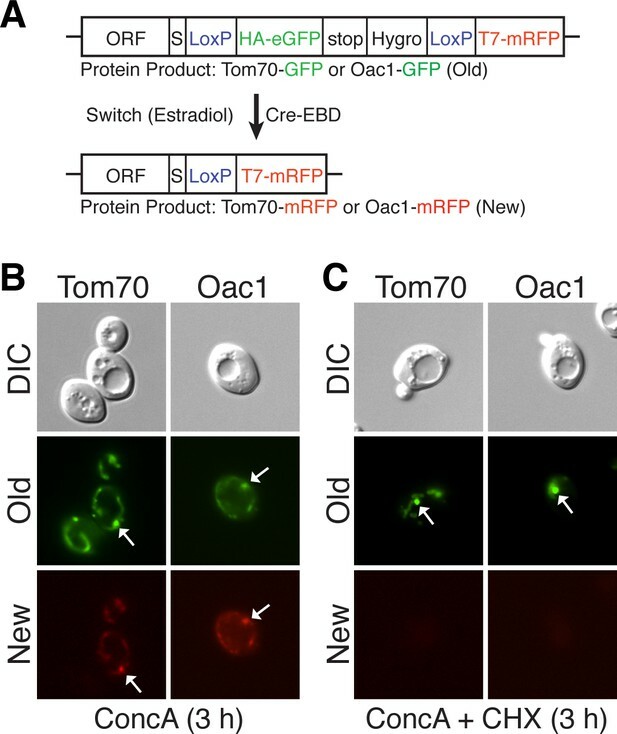 These results suggest we identified an autophagy-dependent pathway for degrading Tom70 in mitochondria from aging yeast cells that requires mitochondrial fission and is distinct from the previously characterized Atg32-dependent pathway. While examining the kinetics of Tom70-GFP vacuolar delivery in aged cells, we noticed that the presence of Tom70 in the vacuole peaked in middle-aged cells, and then declined in old cells (Figure 1A). This decline coincided with a highly fragmented vacuole, depicted in the third panel of Figure 1A. For reasons that are unclear, vacuoles increase in size with age and then can become severely fragmented in very old cells (Figure 1A) (Lee et al., 2012). Interestingly, in all cells with a severely fragmented vacuole, Tom70-GFP appears in small vesicle-like structures in the cytoplasm (Figure 1A and Video 1). These structures are not cytosolically-localized autophagosomes, because they are still present in old cells lacking ATG5 (Figure 1B and Video 2). However, their formation does require the mitochondrial fission GTPase DNM1 (Figure 1B and Video 3). Thus, although mitochondrial protein destruction is activated in middle-aged cells, this autophagy-dependent degradation appears compromised in very old yeast, leading to production of Dnm1-dependent vesicle-like structures. 3D reconstruction of mitochondria and vacuoles in old wild-type cells. A representative 3D reconstruction of an old wild-type cell with the same characteristics as those depicted in Figure 1A showing small mitochondrial vesicle-like fragments (green, marked with Tom70-GFP) outside of the severely fragmented vacuole (red, marked with Vph1-mCherry). To permit visualization of the vacuole lumen, the vacuole isosurface rendering becomes 60% transparent in the middle of the movie. Budscars (blue, calcofluor) at the beginning of the movie indicate the cell’s old age. 3D reconstruction of mitochondria and vacuoles in old atg5△ cells. A representative 3D reconstruction of an old atg5△ cell with the same characteristics as those depicted in Figure 1B showing small mitochondrial vesicle-like fragments (green, marked with Tom70-GFP) outside of the severely fragmented vacuole (red, marked with Vph1-mCherry). To permit visualization of the vacuole lumen, the vacuole isosurface rendering becomes 60% transparent in the middle of the movie. Budscars (blue, calcofluor) at the beginning of the movie indicate the cell’s old age. 3D reconstruction of mitochondria and vacuoles in old dnm1△ cells. A representative 3D reconstruction of an old dnm1△ cell with the same characteristics as those depicted in Figure 1B showing the presence of mitochondria (green, marked with Tom70-GFP), but the absence of small mitochondrial vesicle-like fragments outside of the severely fragmented vacuole (red, marked with Vph1-mCherry). To permit visualization of the vacuole lumen, the vacuole isosurface rendering becomes 60% transparent in the middle of the movie. Budscars (blue, calcofluor) at the beginning of the movie indicate the cell’s old age. We previously showed that mitochondrial dysfunction in aged cells is caused by disruption of a metabolic relationship between mitochondria and vacuoles (Hughes and Gottschling, 2012). Vacuoles are acidified by the Vacuolar-H+-ATPase (V-ATPase) (Kane, 2006), and the proton gradient generated by this protein complex is required for amino acid storage within the vacuole lumen (Klionsky et al., 1990). Loss of vacuole acidity in aged cells causes mitochondrial dysfunction through an undefined mechanism that likely involves altered storage of cellular amino acids (Hughes and Gottschling, 2012). To test if loss of vacuole acidity triggers autophagy-dependent mitochondrial protein degradation, we took advantage of the fact that treatment of young cells with concanamycin A (conc A), a specific inhibitor of the V-ATPase (Drose et al., 1993), recapitulates age-associated changes in mitochondria (Figure 2A) (Hughes and Gottschling, 2012). Consistent with our previous findings, treatment with conc A caused an immediate loss of vacuolar acidity, followed by a decline in mitochondrial △Ψ within 30 min as measured by microscopy (Figure 2B) using the common mitochondrial membrane potential fluorescent dye DiOC6 (Pringle et al., 1989), or by flow cytometry (Figure 2—figure supplement 1) using DiOC6 and another mitochondrial membrane potential dye, TMRM (Scaduto and Grotyohann, 1999). Similar to our observations in aged cells, treatment of young cells with conc A caused accumulation of Tom70-GFP-containing bodies within the vacuole (Figure 2C, white arrows). Because no Tom70-GFP was present in the vacuoles of untreated pep4△ cells, we conclude that loss of vacuolar acidity triggers activation of this pathway. Additionally, in contrast to old cells, it was not necessary to delete PEP4 to observe Tom70-GFP within the vacuole of conc A treated cells. This is likely because inhibition of the V-ATPase with conc A creates an environment within the lumen that prevents autophagosome breakdown (Nakamura et al., 1997). The appearance of Tom70-GFP in the conc A treated vacuole occurred within three hours after mitochondrial depolarization, and was preceded by the formation of a single bright focus that contained Tom70-GFP, but appeared somewhat distinct from the rest of the mitochondria (Figure 2C, white *). 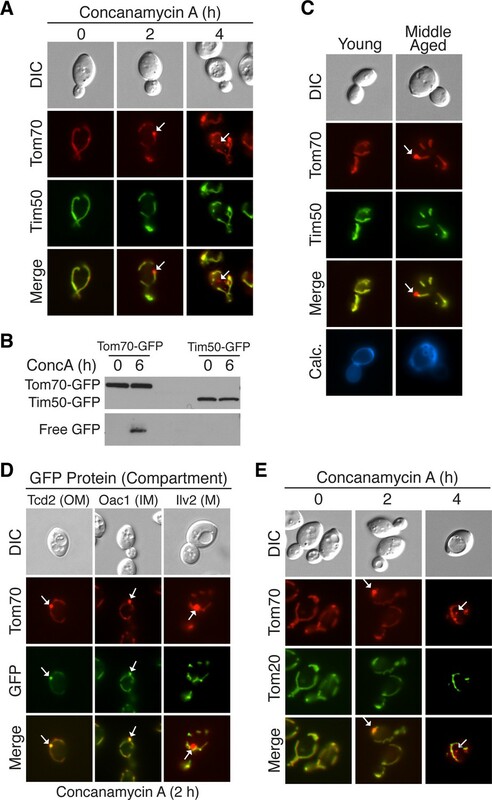 As in old cells, delivery of Tom70-GFP to the vacuole was dependent on both the autophagy (Atg5) and mitochondrial fission machineries (Dnm1), but independent of Atg32 (Figure 2C). Further supporting the role of autophagy in this process, delivery of Tom70-GFP to the vacuole also required the vacuole homotypic fusion protein Vam3, which is essential for fusion of autophagosomes with the vacuole (Figure 2C) (Darsow et al., 1997). Loss of vacuole function triggers mitochondrial protein degradation. (A) Schematic illustration showing that loss of vacuolar acidity (2) through aging or concanamycin A (conc A)-mediated inhibition of the Vacuolar H+-ATPase (1) leads to loss of mitochondrial function (3) through an unknown mechanism. (B) Loss of vacuolar acidity causes rapid mitochondrial depolarization. Wild-type cells expressing Tom70-mCherry were treated with concanamycin A for the indicated time (hr) and stained with DiOC6 as an indicator of △Ψ. N = 30. 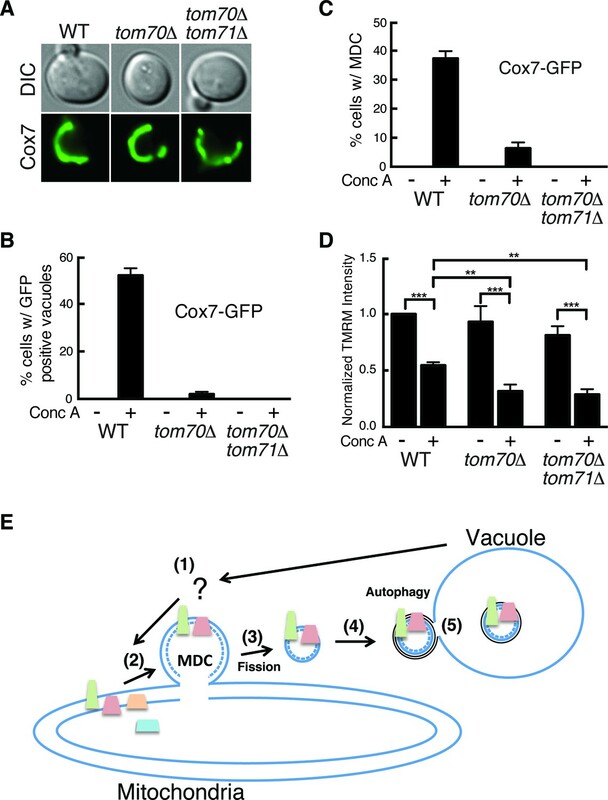 (C) Loss of vacuolar acidity activates autophagy-dependent Tom70-GFP degradation. Wild-type (WT) and the indicated mutant cells expressing Tom70-GFP and Vph1-mCherry were treated with concanamycin A for the indicated time (hr). The presence of Tom70-GFP in the vacuole (white arrow) was scored for each strain and time point. N = 50. * indicates MDC. (D) Tom70-GFP was monitored for autophagy-dependent degradation using a GFP-cleavage assay in wild-type (WT) and the indicated mutant cells treated with concanamycin A (ConcA) for the indicated time (hr). Whole-cell extracts from the treated cells were subjected to immunoblot analysis with anti-GFP antibody. The use of conc A as an inducer potentially limited the amount of GFP cleavage in the vacuole. Consequently, the exposure time of the free GFP immunoblot is 20 times longer than the exposure of the immunoblot with full length Tom70-GFP. In addition to the microscopy-based assays, turnover of GFP-tagged proteins by autophagy can also be detected by monitoring release of free GFP from the epitope-tagged protein in the vacuole using immunoblot analysis (Kanki et al., 2009a). Once released by vacuolar proteases, GFP is stable in the vacuole lumen. The release of GFP from Tom70-GFP was monitored by immunoblot analysis in cells treated with conc A, and the results mirrored what was observed in the microscopy-based assay (Figure 2D). Treatment of cells for six hours caused release of GFP from full length Tom70-GFP (Figure 2D). GFP cleavage required the vacuolar protease PEP4, the autophagy and mitochondrial fission machineries, and was independent of ATG32 (Figure 2D). Collectively, these results suggest that disruption of the mitochondrial-vacuole relationship by direct V-ATPase inhibition activates autophagy-dependent mitochondrial protein degradation. The timing of Tom70-GFP destruction shortly after mitochondrial depolarization raised the possibility that loss of mitochondrial membrane potential may activate this pathway downstream of changes in vacuole acidity. To test this, we analyzed Tom70-GFP vacuolar delivery in cells treated with two common mitochondrial depolarizing agents, the electron transport chain inhibitor antimycin A, and the proton ionophore carbonyl cyanide-4-(trifluoromethoxy)phenylhydrazone (FCCP). Although treatment of cells with these inhibitors caused mitochondrial depolarization equal to or greater than conc A (Figure 3A and B), we did not observe Tom70-GFP delivery to the vacuole at any point during treatment with these compounds (Figure 3C). Instead, mitochondria coalesced in FCCP treated cells, and were largely unchanged with antimycin A treatment (Figure 3C). These results suggest that a decrease in mitochondrial membrane potential is not sufficient to trigger Tom70-GFP degradation. Mitochondrial protein degradation is not triggered by loss of mitochondrial membrane potential or oxidative stress. Antimycin A and FCCP cause mitochondrial depolarization. Wild-type cells were treated with Antimycin A (A) or FCCP (B) for 4 hr, stained with the mitochondrial membrane potential fluorescent dye DiOC6, and analyzed by flow cytometry. FACS profiles and bar graphs showing median fluorescence intensity are shown for each treatment. N > 10,000 cells for each. (C) Loss of mitochondrial membrane potential or oxidative stress does not activate autophagy-dependent Tom70-GFP degradation. Wild-type cells expressing Tom70-GFP were treated with the indicated compound for 4 hr. The presence of Tom70-GFP in the vacuole was scored for each strain and time point. N = 50. Representative images showing mitochondrial aggregation and fragmentation in FCCP and hydrogen peroxide (H2O2) treated cells are shown. In addition to mitochondrial depolarization, loss of vacuolar acidity also causes oxidative stress in cells through an undefined mechanism (Milgrom et al., 2007). Therefore, we also tested whether oxidants trigger activation of this pathway. Treatment of cells with hydrogen peroxide caused mitochondrial fragmentation, but like FCCP and antimycin A, did not lead to the appearance of Tom70-GFP within the vacuole (Figure 3C). This result suggests that oxidative stress is also not sufficient to activate this pathway, and that loss of vacuolar acidity triggers mitochondrial protein degradation through an unknown mechanism. During the analysis of mitochondrial protein degradation in young cells, we noticed a distinct structure containing Tom70-GFP that formed prior to the appearance of Tom70-GFP foci within the vacuole (Figure 2C, white *). We refer to this structure as the mitochondrial-derived compartment (MDC). MDCs appeared attached to mitochondria as a single focus with greater signal intensity than the rest of the organelle. These structures were also present in middle-aged cells undergoing mitochondrial degradation (Figure 4A), and the timing of their appearance suggested that MDCs are an intermediate in this process. The mitochondrial-Derived compartment (MDC) is an intermediate step in mitochondrial protein degradation. (A) Aging induces MDC formation. Middle-aged cells expressing Tom70-GFP and Vph1-mCherry were scored by fluorescence microscopy for the presence of mitochondrial-derived compartment (MDC) structures (white arrow). N = 30. (B) Loss of vacuolar acidity triggers MDC formation. Wild-type (WT) and the indicated mutant cells expressing Tom70-GFP and Vph1-mCherry were treated with concanamycin A for the indicated time (hr). The presence of MDCs (white arrow) was scored for each strain and time point. N = 50. (C) Mitochondrial fission, but not autophagy, is required for MDC release. Representative images of MDCs (white arrow) in DNM1- (dnm1△) and ATG5-deficient (atg5△) cells from (B). To further analyze the kinetics of MDC formation during the degradation process, MDCs were monitored during a timecourse of conc A treatment. In wild-type cells, MDCs appeared shortly after mitochondrial depolarization, and were present in a large percentage of cells within two hours after conc A addition (Figure 4B). Cells generally contained only a single MDC, and it often localized near the vacuolar membrane prior to the appearance of Tom70-GFP inside the vacuole lumen (Figure 4B, white arrows). MDCs formed independently of both autophagy and mitochondrial fission (Figure 4B). However, although fission-defective dnm1∆ cells formed MDCs normally at two hours after conc A addition, at later timepoints, MDCs grew very large in these cells and were not released from mitochondria to the vacuole (Figure 4C, white arrows). This suggests that mitochondrial membrane fission activity is required for release of MDCs for autophagic degradation. In support of this conclusion, Fis1, an essential component of the mitochondrial fission machinery that recruits Dnm1 to mitochondrial membrane (Mozdy et al., 2000), is also required for release of MDCs from mitochondria (Figure 4—figure supplement 1A). Moreover, foci of Dnm1-GFP, representing sites of mitochondrial fission, localize near MDCs in 88% of cells (Figure 4—figure supplement 1B). Collectively, these data suggest that the mitochondrial fission machinery is required for MDC release. Like the fission mutants, autophagy-deficient mutants (atg5△) formed normal MDCs after two hours of conc A treatment (Figure 4C, white arrows), suggesting that autophagy is not required for MDC formation. However, at later timepoints, Tom70-GFP did not enter the vacuole in these mutants, and MDCs were less apparent. Instead, Tom70-GFP was present in small vesicle-like structures (Figure 4C) that looked similar to those that formed in very old cells (Figure 1A). Further supporting the role of autophagy in MDC degradation, MDCs in 68% of cells localized at or near the preautophagosomal structure (PAS) at the vacuole membrane, which is the site of autophagosome formation and target engulfment in yeast (Figure 4—figure supplement 2) (Feng et al., 2014). Taken together, these results suggest that the MDC is an intermediate step on the way to Tom70-GFP degradation in the vacuole by autophagy, and that its release from the mitochondrial surface relies on mitochondrial fission. At this point, we also cannot rule out other alternative fates for the MDC, such as delivery to other cellular compartments. During characterization of the MDC pathway in young cells, we found that unlike Tom70, the inner mitochondrial membrane protein Tim50-GFP was excluded from MDCs and not targeted for vacuolar degradation by this pathway (Figure 5A and B). Similar specificity was apparent in aged cells (Figure 5C), suggesting that MDCs are cargo-selective. Select mitochondrial proteins are incorporated into MDCs. (A) The inner mitochondrial membrane protein Tim50 is excluded from MDC-dependent degradation. Wild-type cells expressing Tom70-mCherry and Tim50-GFP were treated with concanamycin A for the indicated time and representative images showing Tim50 exclusion from the MDC (2 hr, white arrow) and vacuole (4 hr, white arrow) are shown. 100% of cells show this phenotype of Tim50 exclusion. N = 50. (B) Tom70-GFP and Tim50-GFP were monitored for autophagy-dependent degradation using a GFP-cleavage assay in wild-type (WT) cells expressing either Tom70-GFP or Tim50-GFP treated with concanamycin A (ConcA) for the indicated time (hr). Whole-cell extracts from the treated cells were subjected to immunoblot analysis with anti-GFP antibody. As in Figure 2D, the use of conc A as an inducer limited the amount of GFP cleavage in the vacuole. Consequently, the exposure time of the free GFP immunoblot is ~20 times longer than the exposure of the immunoblot with full-length GFP-tagged proteins. (C) Tim50 is excluded from MDCs in middle-aged cells. Wild-type cells expressing Tom70-mCherry and Tim50-GFP were aged and representative images showing Tim50 exclusion from the MDC (white arrow) are shown. 100% of cells show this phenotype of Tim50 exclusion. N = 30. (D) Mitochondrial outer membrane proteins and inner membrane carrier proteins localize to MDCs. Wild-type cells expressing Tom70-mCherry and the indicated C-terminal GFP fusion proteins were treated with concanamycin A for 2 hr and protein inclusion in MDCs (white arrows) was assessed. GFP-tagged marker proteins represent mitochondrial outer membrane (OM), inner membrane carrier proteins (IM), and matrix proteins (M). 100% of cells show the phenotypes in the representative images. N = 50. (E) Tom20 is excluded from MDCs. Wild-type cells expressing Tom70-mCherry and Tom20-GFP were treated with concanamycin A for the indicated time and representative images showing Tom20 exclusion from the MDC (2 hr, white arrow) and vacuole (4 hr, white arrow) are shown. 100% of cells show this phenotype of Tom20 exclusion. N = 50. To understand the extent of cargo-selectivity, a microscopy-based screen was performed to identify the proteins that are incorporated into MDCs. For the screen, we created a collection of yeast strains coexpressing Tom70-mCherry and any protein of interest fused to GFP by crossing a strain containing Tom70-mCherry to the yeast GFP strain collection (Huh et al., 2003). Strains containing GFP-tagged mitochondrial-localized proteins were screened after conc A treatment in a similar manner to the Tim50-GFP/Tom70-mCherry strain in Figure 5A. In total, 469 mitochondrial proteins were examined (Supplementary file 1) and 304 of the proteins were detectable by microscopy. Of those, 26 localized to MDCs and were degraded in the vacuole (Table 1), indicating that this pathway exhibits narrow substrate specificity. Although the MDC incorporated a relatively small number of the total proteins examined, it is likely specific for mitochondrial proteins, because markers of other major organelles were not co-localized with MDCs (Figure 5—figure supplement 1). Mitochondrial proteins broadly localize to four distinct mitochondrial subdomains: the outer membrane, inner membrane, inner membrane space, and matrix (Fox, 2012). There was subdomain specificity in mitochondrial proteins that were targeted to the MDC. Representative examples of substrates and non-substrates from various mitochondrial subcompartments are shown in Figure 5D. Nearly all integral- and peripherally-associated mitochondrial outer membrane proteins, as well as a subclass of mitochondrial inner membrane proteins belonging to the mitochondrial carrier family localized to the MDC. In contrast, mitochondrial matrix proteins and inner membrane proteins that were not part of the carrier family were excluded. Because they were below the detection limit of the assay, it was not possible to ascertain whether mitochondrial inner membrane space proteins or β-barrel proteins of the outer membrane were present in MDCs. The MDC substrate specificity followed classic lines of mitochondrial import (Schmidt et al., 2010). Many matrix and inner membrane-localized mitochondrial proteins contain a mitochondrial targeting sequence that is removed upon import into the mitochondria. After being translated in the cytoplasm, this class of presequence-containing proteins generally binds to the mitochondrial surface receptor Tom20, and then are routed through the TOM complex of the outer membrane and the Tim23 complex of the inner membrane to their final destination. Proteins that are normally imported via this pathway were excluded from MDCs (Figure 5D and Supplementary file 1). In contrast to presequence-containing proteins, integral inner membrane carrier proteins of the metabolite carrier family and alpha-helical outer membrane proteins lack a cleavable mitochondrial presequence (Harbauer et al., 2014). After translation, these proteins bind to the Tom70 mitochondrial surface receptor, and then are targeted to the inner membrane through the Tim22 complex or to the outer membrane through the Mim1 pathway (Becker et al., 2011). All detectable proteins that rely on Tom70-associated import pathways were targeted to MDCs, including Tom70 itself (Table 1). In further support of the distinction between the Tom20 and Tom70 import pathways, Tom20 was excluded from MDCs (Figure 5E), even though it is an integral outer membrane protein (Schneider et al., 1991). Even Cox7, which is not a carrier protein, but lacks a cleavable presequence and thus likely utilizes Tom70 for mitochondrial import was targeted to MDCs (Table 1) (Calder and McEwen, 1990; Mihara and Blobel, 1980). Thus, the MDC pathway only degraded a subset of mitochondrial proteins, and was specific for non-presequence containing proteins that rely on the Tom70 surface receptor for import. Because MDC substrates were specifically confined to Tom70-dependent import pathways, we wondered if the MDC was an aggregate of newly synthesized proteins that could not be imported into dysfunctional mitochondria. If this were true, proteins incorporated into MDCs would be newly synthesized, not preexisting mitochondrial proteins. To test this, old and newly synthesized versions of proteins were monitored for their incorporation into the same MDC using the recombination induced tag exchange (RITE) system (Verzijlbergen et al., 2010). As illustrated in Figure 6A, fusion of the RITE cassette to a protein of interest allows rapid and permanent switching of epitope tags through an estradiol-inducible Cre/loxP based mechanism. With this system, old protein synthesized before the switch is GFP tagged, while all subsequently synthesized protein is mRFP tagged. The RITE cassette was fused to Tom70 and Oac1, outer and inner membrane MDC substrates, respectively. Cells expressing these proteins were treated with conc A to induced MDC formation, along with estradiol to switch tags on the proteins from GFP to mRFP. Both mRFP and GFP versions of each protein were found in the MDC (Figure 6B), suggesting that MDCs incorporate old, preexisting proteins, and are not specific to unimported mitochondrial substrates. Because the mRFP-tagged protein targeted to MDCs may be synthesized prior to their formation, we cannot determine with this assay whether newly synthesized mitochondrial proteins are also targeted to this compartment. However, further supporting the idea that MDCs incorporate proteins that preexist within mitochondria, MDCs still formed in the presence of cycloheximide, which effectively prohibited synthesis of the newly synthesized version of both RITE-tagged Tom70 and Oac1 (Figure 6C). These results suggest that preexisting mitochondrial proteins are segregated into MDCs prior to degradation by autophagy. MDCs sequester preexisting mitochondrial proteins. (A) Schematic of the recombination induced tag exchange (RITE) system. In untreated cells, the RITE-tagged ORF is expressed with a C-terminal HA-GFP fusion (old protein). Treatment with estradiol induces Cre-EBD dependent recombination between LoxP sites creating a new C-terminal T7-mRFP fusion (new protein). (B) Preexisting protein is incorporated into MDCs. Cells expressing either RITE-tagged Tom70 or Oac1 were treated with estradiol and concanamycin A simultaneously for 3 hr to induce epitope tag exchange and MDC formation. Cells were visualized with fluorescence microscopy for the presence of preexisting (old) or newly synthesized (new) protein in the MDC (white arrows). 100% of the cells show the represented phenotype. N= 50. (C) MDCs (white arrows) form in the absence of new protein synthesis. Cells expressing RITE-tagged Tom70 or Oac1 were treated as in (B) with the addition of cycloheximide to inhibit synthesis of new T7-RFP tagged proteins. 100% of the cells show the represented phenotype. N= 50. Because the proteins degraded by the MDC pathway all rely on the mitochondrial import receptor Tom70 for import into mitochondria, we wondered whether Tom70 is required for MDC formation beyond its role in mitochondrial import (Sollner et al., 1990). To test this, we monitored the appearance of the MDC substrate Cox7-GFP (Table 1) in the vacuole of conc A treated cells. Cox7-GFP acts exactly the same as Tom70-GFP upon concanamycin A treatment, entering MDCs at 2 hr and getting delivered to the vacuole after four hours of treatment (Figure 7—figure supplement 1A–B). Despite the fact that Tom70 [and its paralog Tom71 (Schlossmann et al., 1996)] are likely required for import of Cox7 into the mitochondria (Schlossmann et al., 1996; Schmidt et al., 2010), a large amount of Cox7 still localized to mitochondria in both tom70△ and tom70△ tom71△ cells (Figure 7A). This import likely results from compensation by import receptors Tom20 and Tom22 (Lithgow et al., 1994; Ramage et al., 1993; Steger et al., 1990). Nevertheless, deletion of TOM70 alone severely impaired conc A induced vacuolar delivery of Cox7 (Figure 7B), and loss of both Tom70 and 71 provided complete inhibition (Figure 7B). The mitochondrial import receptors Tom70 and Tom71 are required for MDC formation. (A) The MDC substrate Cox7 localizes to mitochondria lacking TOM70 and 71. Wild-type (WT) and the indicated mutant strains expressing the inner membrane protein Cox7-GFP were visualized by fluorescence microscopy. 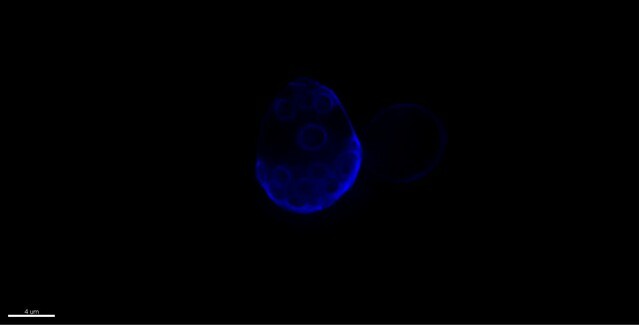 (B) Tom70 and 71 are required for vacuole delivery of Cox7-GFP. Quantification of Cox7-GFP in vacuoles of wild-type (WT) and the indicated mutant strains treated with concanamycin A (conc A) for 4 hr. Data represents percentage of cells with Cox7-GFP in the vacuole. Error bars represent standard deviation of 3 replicates. N = 100 for each replicate. (C) Tom70 and 71 are required for MDC formation. Quantification of Cox7-GFP containing MDCs in fission deficient strains lacking the indicated genes treated with concanamycin A (conc A) for 2 hr. Data represents percentage of cells with Cox7-GFP in MDCs. Error bars represent standard deviation of 3 replicates. N = 100 per replicate. (D) Failure to form MDC exacerbates membrane potential loss. Median fluorescence intensity of mitochondrial dye TMRM in wild-type (WT) and the indicated mutant strains treated with and without conc A for 4 hr as measured by flow cytometry. Median fluorescence intensity of a population of cells is presented as a percentage of the WT untreated sample (which is set at 100). N > 20,000 cells. Error bars represent standard deviation of three independent replicates. **p<0.01, ***p<0.001, multiple comparison one-way anova test. (E) Model of the MDC pathway. Loss of vacuole function caused by aging or other mechanisms produces an unknown signal (Step 1) that triggers MDC formation (Step 2). Select mitochondrial inner and outer membrane proteins are incorporated into MDCs, which are subsequently released from mitochondria by the fission GTPase Dnm1 (Step 3). MDCs are then engulfed by autophagosomes (Step 4), and delivered to the vacuole for degradation by autophagy (Step 5). It is currently not clear if the mitochondrial inner membrane (dashed line) is incorporated into MDCs. To determine at which step in MDC-mediated degradation Tom70 and Tom71 function, we quantified the amount of Cox7-GFP present in MDCs from a conc A treated fission deficient strain (dnm1∆). Loss of TOM70 alone severely blocked MDC formation, and the loss of both TOM70 and TOM71 was completely inhibitory (Figure 7C). Collectively, these results suggest that in addition to their function as mitochondrial import receptors, Tom70 and Tom71 are also required for formation of MDCs and the destruction of mitochondrial proteins residing within them. Because MDC formation coincided with depletion of the mitochondrial membrane potential (Hughes and Gottschling, 2012), we wondered whether MDC formation could protect mitochondria against further membrane potential loss. To test this, we monitored mitochondrial membrane potential by flow cytometry in conc A treated cells using TMRM. As expected, wild-type cells showed a reduction in TMRM staining after conc A treatment (Figure 7D and Figure 7—figure supplement 1C–D). In the absence of conc A, cells lacking TOM70 alone or both TOM70 and TOM71 had a similar membrane potential as wild-type cells. However, upon treatment with conc A, these cells showed a greater reduction in TMRM staining (Figure 7D and Figure 7—figure supplement 1C–D). At this time, we cannot rule out the possibility that further depletion of membrane potential in these strains results from a function of Tom70/71 unrelated to MDC formation. However, because these mutant strains cannot form MDCs under these conditions, it is possible that the sequestration of mitochondrial membrane proteins by MDCs may protect against mitochondrial depolarization caused by changes in vacuolar function. Using yeast as a model, we have identified a new form of autophagy-dependent mitochondrial protein degradation that is activated in aged cells undergoing vacuole-induced mitochondrial dysfunction. This pathway specifically destroys a subset of the mitochondrial membrane proteome through a series of steps outlined in Figure 7E. First, loss of acidity in the vacuole of aged or young cells triggers formation of a mitochondrial derived compartment, or MDC, through an unknown signal. Preexisting mitochondrial outer and inner membrane proteins that rely on Tom70 for import into the mitochondria are sequestered into the MDC through a mechanism that requires the import receptors Tom70/71. After formation, the entire MDC or portions of it are released from the mitochondria by a process that requires the mitochondrial fission machinery, and subsequently delivered to the vacuole by autophagy. Our data suggests that MDC formation helps protect mitochondria from vacuole-induced stress, as cells that cannot form MDCs exhibit a greater loss of membrane potential in response to disruption of vacuolar acidity (Figure 7D). A collapse of MDC-mediated autophagy occurs in very old yeast cells, leading to Dnm1-dependent formation of small Tom70-containing vesicle-like structures in the cytoplasm (Figure 1A). Interestingly, deletion of DNM1 has been reported to extend lifespan in yeast (Scheckhuber et al., 2007), raising the possibility that these Tom70-containing mitochondrial fragments may contribute to cell toxicity or death in aged yeast. The discovery of the MDC pathway raises new questions about the function of this system and how it relates to other known forms of mitochondrial protein degradation (Anand et al., 2013). The MDC pathway appears mechanistically distinct from other autophagy-dependent systems such as PINK1/Parkin- and Atg32-dependent mitophagy (Kanki et al., 2011; Youle and Narendra, 2011). Both of these pathways are thought to degrade whole portions of mitochondria, whereas MDCs selectively destroy a subset of mitochondrial membrane associated proteins. In this light, MDCs appear to have more in common with mitochondrial-derived vesicles, or MDVs, an autophagy-independent form of mitochondrial quality control thus far only identified in mammals (Sugiura et al., 2014). Several different classes of MDVs have been described to date, and all of them selectively incorporate a subset of the mitochondrial proteome for delivery to the peroxisome or lysosome (Neuspiel et al., 2008; Soubannier et al., 2012a). However, MDCs also differ from MDVs. Although the complete substrate specificity of MDVs is not well defined, it is clearly different than MDCs (Neuspiel et al., 2008; Soubannier et al., 2012b). Additionally, unlike MDCs, release of MDVs from mitochondria does not require the mitochondrial fission machinery (Neuspiel et al., 2008). Interestingly, recent studies have suggested that the PINK1/Parkin- and Atg32-mitophagy pathways might also act in substrate selective manners like MDCs and MDVs (Abeliovich et al., 2013; Chan et al., 2011; Vincow et al., 2013). This raises the intriguing possibility that substrate selectivity may be a common theme of many different mitochondrial protein degradation systems. What is the function of the MDC pathway? The answer to this question may lie in the nature of the substrates targeted for degradation through MDCs. By screening through the mitochondrial proteome, we found that membrane proteins lacking defined mitochondrial-targeting presequences are sequestered into MDCs. These proteins require the mitochondrial surface receptor Tom70 for import into the mitochondria (Schmidt et al., 2010). The largest class of these Tom70-dependent import substrates is the mitochondrial carrier proteins, an evolutionarily conserved family of nutrient transporters that facilitate exchange of metabolites across the mitochondrial inner membrane (Palmieri and Pierri, 2010). Yeast contain ~35 members of this family in their inner membrane, which have affinity for many different metabolites including amino acids, nucleotides, metals, and TCA cycle intermediates. Interestingly, MDC formation is triggered by inhibiting vacuolar function. One important function of the vacuole is storage of nutrients (Klionsky et al., 1990), and we previously showed that mitochondrial failure in response to loss of vacuole acidity results from impaired storage of nutrients such as amino acids within the vacuole lumen (Hughes and Gottschling, 2012). This raises the possibility that the purpose of the MDC pathway is to sequester mitochondrial nutrient transporters in response to cytoplasmic nutrient overload (Wellen and Thompson, 2010), perhaps to prevent unregulated nutrient influx into the mitochondria. Alternatively, the MDC pathway may degrade nutrient transporters to adjust mitochondrial metabolism towards a state preferable to survive vacuole impairment. In considering the MDC in nutrient transporter destruction, it is worth noting the similarity of MDCs to a recently characterized vacuole-derived compartment which functions in the turnover of a vacuole nutrient transporter (Li et al., 2015). These compartments form from the vacuole membrane in response to cellular nutrient fluctuations, and have been shown to sequester a vacuolar lysine transporter away from the rest of the vacuolar membrane. They look morphologically similar to MDCs, but interestingly, are destroyed after release from the vacuole membrane by the multivesicular body pathway, not autophagy. Whether these vacuole-derived compartments are related in any way to MDCs is currently unclear. However, given the intimate metabolic relationship between the vacuole and mitochondria (Rutter and Hughes, 2015), and the recent identification of a physical tether (vCLAMP) between these organelles (Elbaz-Alon et al., 2014; Honscher et al., 2014), it will be important to explore the relationship between MDCs and vacuole-derived compartments (Li et al., 2015), as well as to determine the role of the MDC in vacuole-mitochondria crosstalk. Another unanswered question is how are MDCs formed? At this point, we know that the MDC contains both inner and outer mitochondrial membrane-associated proteins, and that proteins incorporated into MDCs preexist within mitochondria. This suggests a sorting and segregation system exists in the inner and outer mitochondrial membranes. The nature of how that might occur is unclear, but the import receptor Tom70/71 plays a role in the formation of the MDC. This suggests that these proteins have roles beyond their function in mitochondrial import. Consistent with this idea, Tom70/71 are known to be required for recruiting an F-box protein Mfb1 to the mitochondrial surface (Kondo-Okamoto et al., 2008), and were recently shown to form an ER-mitochondrial tether with the ER sterol-transport protein Ltc1/Lam6 (Murley et al., 2015). It will ultimately be important to determine whether MDC’s contain a single or double membrane, which along with identifying more MDC formation machinery will begin to shape our understanding of how proteins might be incorporated into these structures. At the moment, we cannot rule out the possibility that MDCs are formed through fusion of small mitochondrial-derived vesicles that are currently undetectable in our assay. Finally, it will be interesting to determine how MDCs are linked to the autophagy machinery for degradation. Autophagy can selectively degrade a number of organelles, cellular substructures, and protein aggregates (Stolz et al., 2014). In mammals, the degradation of these structures is often facilitated by ubiquitination of target molecules to be degraded (Kirkin et al., 2009). Ubiquitin tags are recognized by adaptor proteins such as p62, which bind both ubiquitin and the autophagy protein Atg8/LC3 to link target molecules to the autophagy machinery (Pankiv et al., 2007). However, yeast homologs of p62 lack ubiquitin-binding domains, and until very recently, it was unclear if yeast could target proteins for autophagy-dependent degradation through ubiquitin tagging (Rogov et al., 2014). However, a recent study identified the conserved CUET protein Cue5 as an ubiquitin/Atg8-binding adaptor protein that facilitates autophagy-dependent turnover of ubiquitylated protein aggregates (Lu et al., 2014). It remains to be seen whether ubiquitylation and the CUET protein family play any role in the MDC pathway. The discovery of the MDC pathway adds to a growing list of diverse systems for mitochondrial protein degradation. Understanding how these pathways function in concert with one another to maintain mitochondrial integrity in the face of various cellular stresses will ultimately be important for combating mitochondria-associated disease. All yeast strains are derivatives of S. cerevisiae S288c (Brachmann et al., 1998) and are listed in Supplementary file 2. Strains were created by one step PCR-mediated gene replacement and epitope tagging using standard techniques (Brachmann et al., 1998; Sheff and Thorn, 2004). Oligos to construct strains are listed in Supplementary file 3. Plasmid templates for tagging and knockout construction were from the previously described pRS, pKT, and pBSseries of vectors (Brachmann et al., 1998; Shaner et al., 2004; Sheff and Thorn, 2004). pBS34 was obtained from the Yeast Resource Center at the University of Washington with permission from Roger Tsien. RITE tagged strains were created using the previously described template plasmid pVL015 (Verzijlbergen et al., 2010). A collection of yeast strains expressing Tom70-mCherry/any protein-GFP was created by crossing a Tom70-mCherry query strain (UCC4997, see Supplementary file 2) to the yeast GFP strain collection (Huh et al., 2003) using a Biomek Robot and standard techniques for high-throughput strain construction (Tong and Boone, 2006). Strains were maintained and used for screening as diploids with both Tom70-mCherry and the GFP-fused proteins of interest in a heterozygous state. The final genotype of all strains in the collection is: MATa/MATα his3△1/his3△1 leu2△0/leu2△0 ura3△0/ura3△0 met15△0/+ lys2△0/+ anygene-GFP-His3MX/+ TOM70-mCherry-KanMX/+. Strains used in Figure 5D (Tcd2, Oac1, and Ilv2), as well as Figure 5—figure supplement 1 (Sec63, Erg6, Pex11, Vrg4, and Sec7) and Figure 7—figure supplement 1A–B (Cox7) are from this strain collection. The GFP-ATG8 reporter strain used in Figure 4—figure supplement 2 expresses an extra copy of GFP-ATG8 from a GPD promoter integrated into an empty region of chromosome I (between 199456 and 199457). This strain was created by transformation and insertion of NotI-digested plasmid pAG306-GPD-eGFP-ATG8 chr I, which is described below. pAG306-GPD-eGFP-ATG8 chr I is a plasmid that can be integrated into an empty region of yeast chromosome I after digestion with the restriction enzyme NotI. The plasmid expresses GFP-ATG8 from the constitutive GPD promoter. pAG306-GPD-eGFP-ATG8 chr I was constructed in two steps. First, we created pAG306-GPD-eGFP-ccdB chr I, a plasmid for high expression of N-terminal GFP fusion constructs from the GPD promoter that can be integrated into chromosome I (199456–199457) after NotI digestion. We generated pAG306-GPD-eGFP-ccdB chr I by ligation of a SmaI-digested fusion PCR product that contained two ~500 base pair regions of chromosome I flanking a NotI site into AatII-digested pAG306-GPD-eGFP-ccdB (Addgene plasmid 14308) (Alberti et al., 2007). We generated the fusion PCR product using oligos ChrI PartB SmaI F and ChrI PartA SmaI R to amplify two templates generated by PCR of yeast genomic DNA using oligo pairs ChrI PartA NotI F and ChrI PartA SmaI R, and ChrI PartB SmaI F and ChrI PartB NotI R, respectively. Second, we inserted ATG8 into pAG306-GPD-eGFP-ccdB chr I from donor Gateway plasmid pDONR201-ATG8 (HIP ID ScCD00011665) using LR clonase according to manufacturer’s instructions (Thermo Fisher Scientific, Waltham, MA) (Hu et al., 2007). As previously described (Hughes and Gottschling, 2012), cells were grown exponentially for 15 hr to a max density of 5 x 106 cells/ml before the start of all aging and MDC assays. This period of overnight log-phase growth was carried out to ensure vacuolar and mitochondrial uniformity across the cell population. Cells were cultured in YEPD (1% yeast extract, 2% peptone, 2% glucose) for all experiments. Yeast Complete (YC) medium used during construction of the Tom70-mCherry GFP strain collection was previously described (Tong and Boone, 2006; van Leeuwen and Gottschling, 2002). Concanamycin A (Sigma-Aldrich, St. Louis, MO) was added to cultures at a final concentration of 500 nM as indicated in figure legends. In the RITE tag experiments, cycloheximide (Sigma-Aldrich) was added at a final concentration of 50 μg/ml, and β-estradiol at 1 μM. In Figure 3, FCCP (Sigma-Aldrich), Antimycin A (Sigma-Aldrich), and hydrogen peroxide (Sigma-Aldrich) were added at to cultures at final concentrations of 10 μM, 20 μg/ml, and 3 mM, respectively. For MDC assays, overnight log-phase cell cultures were grown in the presence or absence of conc A for the indicated time in the figure legends (0–6 hr). Cells were harvested by centrifugation, and imaged live in all experiments. The number of cells with MDCs or Tom70-GFP in vacuole-localized autophagosomes was quantified in each experiment at the appropriate timepoint. For screening of the Tom70-mCherry/GFP collection to identify MDC substrates, all strains were grown in batches of 20 following the same procedure used for all other MDC assays. For aging experiments, we used the Mother Enrichment Program (MEP) (Lindstrom and Gottschling, 2009) coupled to biotin/streptavidin purification to isolate cells of different replicative ages for microscopy analysis. Biotin labeling and purification of MEP cells was carried out exactly as previously described (Hughes and Gottschling, 2012). Briefly, to attach biotin to the cell surface, we washed 2.5 x 107 cells from a 15 hr YEPD log-phase culture twice in phosphate buffered saline, pH 7.4 (PBS) and resuspended in PBS with 3 mg/ml Sulfa-NHS-LC-Biotin (Thermo Fisher Scientific) at a final concentration of 2.5 x 107 cells/ml. Cells were incubated for 30 min at room temperature (RT), followed by two washes in PBS and one in YEPD. Biotinylated cells were resuspended in 10 ml of YEPD at 2.5 x 106 cells/ml and recovered with shaking for 2 hr at 30°C. These cells were used to seed cultures at a density of 2 x 104 biotinylated cells/ml in YEPD for aging experiments. To initiate the MEP aging program, β-estradiol (1 μM) was added to cultures and cells were grown at 30° for an appropriate time to obtain cells of a desired age (~1 hr for young cells, 12 hr for middle-aged, and 24 hr for old cells). Cell densities never exceeded 4 x 106 cells/ml. 1 x 108 total cells were harvested for purification and microscopy analysis at each timepoint. For purification after aging, cells were washed twice with PBS, and then resuspended in 500 μl of PBS at a density of 2 x 108 cells/ml. Cells were then incubated for 30 min at RT with 25 μl of streptavidin-coated magnetic beads (MicroMACS, Miltenyi Biotec, Germany). Cells were then washed twice in PBS, resuspended in 8 ml of PBS, and loaded onto a LS MACS column (Miltenyi Biotec) that had been equilibrated with 5 ml of PBS. Cells on the column were washed twice with 8 ml of PBS. Columns were then removed from the magnetic field and aged cells were eluted by gravity flow with 8 ml of PBS. Cells were centrifuged to concentrate them for microscopy analysis. 3,3’-dihexyloxacarbocyanine iodide (DiOC6) (Thermo Fisher Scientific) staining was carried out as previously described (Hughes and Gottschling, 2012). Briefly, 2 x 106 log-phase cells were washed once in 10 mM HEPES, pH 7.6 + 5% glucose and then resuspended in 1 ml of the same buffer containing 175 nM DiOC6. Cells were then incubated for 15 min at RT, followed by two washes with 10 mM HEPES, pH 7.6 + 5% glucose. Cells were resuspended in 10 mM HEPES, pH 7.6 + 5% glucose for imaging. Tetramethylrhodamine methyl ester (TMRM) (Thermo Fisher Scientific) staining was carried out exactly as DiOC6 staining, except that cells were incubated with 50 nM TMRM. For aging experiments, cell age was determined by calcofluor (Sigma-Aldrich) staining of bud scars. For this analysis, 5 μg/ml calcofluor was included in the first post-staining wash step prior to imaging. For each experiment, cells were grouped into 3 categories based on age range: Young (0–4 budscars); middle-aged (7–12); and old (>17). For fluorescence microscopy analysis in all figures except those noted below, cells were visualized under 60X oil magnification using a Nikon Eclipse E800 with the appropriate filter set. Images were acquired with a CoolSNAP HQ2 CCD camera (Photometrics, Tucson, AZ) and quantified and processed using Metamorph version 7.1.1.0 imaging software. For DiOC6 experiments, cells were scored as reduced if they exhibited at least a 2-fold decrease in mean fluorescence intensity. Microscopy analysis in Figures 3, 7, and Figure 4—figure supplements 1B and 2 was carried out using a 100X oil objective on a Zeiss AxioImager M2 using the appropriate filter sets. Images were acquired with an Axiocam 506 mono camera, and processed using Zen imaging software (Zeiss, Germany). Images in Figure 4—figure supplements 1B and 2 represent maximum intensity projections of 6–10 step Z-stacks. For Videos 1–3 showing Tom70-GFP and Vph1-mCherry in old yeast cells, Z-stack images were acquired with a DeltaVision Elite imaging system (GE Healthcare, United Kingdom) using a 100X, 1.4 NA oil immersion lens and a CoolSNAP HQ2 CCD camera (Photometrics). Images were deconvolved with SoftWoRx 6.5.2 image analysis software (GE Healthcare) and images of the vacuole and mitochondria were IsoSurface rendered in Imaris 8.2.0 software (Bitplane, Switzerland). After DiOC6 or TMRM staining, cells were analyzed on a BD LSRFortessa X-20 equipped with the appropriate filter sets. At least 10,000 events were analyzed for each sample. Statistical analysis for Figure 7D was conducted using Graphpad Prism software. 2 x 107 log-phase cells were resuspended in 100 μl H2O. An equal volume of 0.2 M NaOH was added to the cell suspension, and cells were incubated 5 min at room temperature. Samples were then centrifuged at 20,000 x g for 10 min at 4°C. Pellets were resuspended in SDS-lysis buffer (10 mM Tris-HCl, pH 6.8, 100 mM NaCl, 1% SDS, 1 mM EDTA, and 1 mM EGTA) containing protease inhibitors (leupeptin, pepstatin, PMSF, and aprotinin) for western blot analysis. Immunoblotting was carried out exactly as previously described (Hughes and Gottschling, 2012). Anti-GFP primary antibody was from Roche (Switzerland) (#11814460001), and secondary HRP-conjugated antibodies from Jackson Immunoresearch (West Grove, PA). Biochimica Et Biophysica Acta (BBA) - Molecular Cell Research 1833:195–204. The Journal of Cell Biology 194:387–395. Antioxidants & Redox Signaling 22:977–994. Biochimica Et Biophysica Acta (BBA) - Molecular Cell Research 1823:49–55. The Journals of Gerontology Series A: Biological Sciences and Medical Sciences 70:1334–1342. Microbiology and Molecular Biology Reviews 70:177–191. Antioxidants & Redox Signaling 14:1989–2001. The Journal of Cell Biology 119:287–299. Free Radical Biology and Medicine 50:963–970. Proceedings of the National Academy of Sciences of the United States of America 109:4916–4920. The Journal of Biological Chemistry 269:15325–15330. Proceedings of the National Academy of Sciences of the United States of America 77:4160–4164. Journal of Biological Chemistry 282:7125–7136. The Journal of Cell Biology 151:367–380. Biochimica Et Biophysica Acta (BBA) - Molecular Cell Research 1853:2766–2774. Proceedings of the National Academy of Sciences of the United States of America 111:8019–8024. Methods in Cell Biology 31:357–435. Trends in Endocrinology & Metabolism 26:59–68. Journal of Biological Chemistry 271:17890–17895. The Journal of Cell Biology 111:2353–2363. The Journal of Cell Biology 119:301–311. Methods in Molecular Biology 313:171–192. Proceedings of the National Academy of Sciences of the United States of America 107:64–68. Proceedings of the National Academy of Sciences of the United States of America 110:6400–6405. Nature Reviews Molecular Cell Biology 12:9–14. Thank you for submitting your work entitled "Selective sorting and destruction of mitochondrial membrane proteins in aged yeast" for consideration by eLife. Your article has been favorably evaluated by Richard Losick (Senior editor) and four reviewers, one of whom, Andrew Dillin, is a member of our Board of Reviewing Editors. The following individuals involved in review of your submission have agreed to reveal their identity: Suzanne Pfeffer, Thomas Nyström, and Liza Pon (peer reviewers). As you will find, all three reviewers and the Reviewing editor are enthusiastic about the body of work presented. The authors put forth very compelling and interesting data to suggest that mitochondria in yeast might possess a quality control system to selectively remove outer membrane proteins in a vesicle like structure that is ultimately destined for the lysosome. The idea of a mitochondrial derived compartment that plays a role in mitochondrial integrity is exciting and provides an explanation for selective degradation of some mitochondrial clients. While there are differences among some of the reviewers’ comments, a shared theme of all includes better characterization of the MDC. This is particularly relevant since this is the first description of this compartment and the similarities/differences of mitochondrial derived vesicles (MDVs) needs to be better flushed out. Along these lines, the origination of the MDC with the autophagy machinery needs a deeper look and each reviewer has suggested a few experiments. Finally, the analysis of which mitochondrial perturbations can generate the MDC needs a little more analysis and suggestions to include mitochondrial toxins is a good place to start. Overall, the reviews are very favorable and please contact the Reviewing editor if you need additional input. In the manuscript submitted by Hughes et al. entitled "Selective sorting and destruction of mitochondrial membrane proteins in aged yeast", the authors put forth very compelling and interesting data to suggest that mitochondria in yeast might possess a quality control system to selectively remove outer membrane proteins in a vesicle like structure that is ultimately destined for the lysosome. 1) Tom70-GFP is found inside the vacuole (lacking the major peptidase, pep4) of old cells and conditions where the vacuole acidity is altered (conc A treated cells). 2) The trafficking to the vacuole appears partially dependent upon the autophagy pathway since it is atg5 dependent. 3) Trafficking to the vacuole is independent of mitophagy. 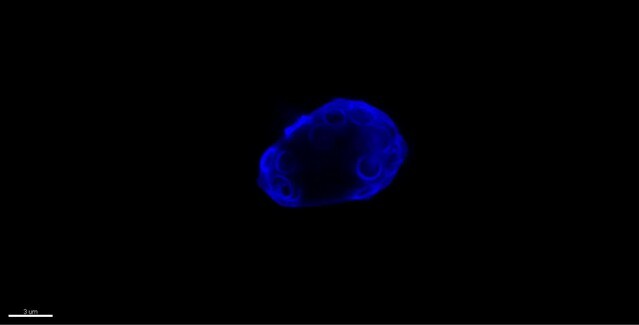 Experiment shows Tom70-GFP in vacuole in atg32 mutant cells. 4) The origin of the vesicle is suggested to require the fission machinery since Dnm1 mutations block Tom70-GFP accumulation in vacuole. 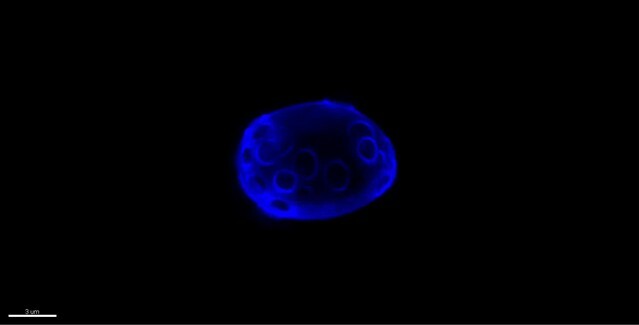 5) During aging, the vacuole becomes fragments and the appearance of small vesicles containing Tom70-GFP is found. 6) Tom70-GFP vesicles appear shortly after depolarization of mitochondria before entry to vacuole. 7) Cargo is selective to outer membrane proteins that require Tom70/71. Tom20 not required. 8) Trafficking to the vacuole seems to include both newly synthesized and older proteins, suggesting it is not a back-up of non-translocated proteins. In summary, the paper is very fascinating and suggests a new avenue for mitochondrial quality control that could be distinct from mitophagy and mitochondrial derived vesicles (MDVs) found in metazoan cells. Cargo for MDVs include oxidized proteins, lipids, outer membrane proteins and the target is lysosomes and peroxisomes. MDVs require PINK1/Parkin, DRP-1 independent and autophagy independent. The stress that causes MDVs to form include antimycin and other harsh mitochondrial toxins. The cargo of MDCs contains outer membrane proteins and import carriers that are targeted to the lysosome. Dnm1 dependent and autophagy independent. Yeast do not have a PINK1/Parkin pathway, so it is unknown if they could be involved if the MDC is conserved in metazoa. The aging process and de-acidification of the lysosome allows observation of MDCs. 1) While the RITE experiment is very clever and suggests that newly made and older proteins can be found in MDCs (well, actually found in lysosome), how sure are the authors that fused proteins of interest are not sitting in the cytoplasm due to the inability to be translocated to the mitochondria? Because all perturbations tested resulted in membrane depolarization and the Tom70/71 complex is essential for this process, which requires membrane polarization for import, could this be a clearance mechanism for non-transported proteins? For example, could a cytoplasmic localized Tom70-GFP be found in the lysosome using the conditions described here? 2) Do other mitochondrial stresses also induce MDC? Oxidative stress or starvation? 3) The ATG32 experiments are very interesting. However, my understanding of the literature is that mitophagy mediated by ATG32 only occurs during starvation. It is not clear if the negative results showing that ATG32 is not required were done under vegetative or starved conditions where ATG32 is required. 4) Because there is close correlation of "fizzed" mitochondria with appearance of the MDC, does blocking fusion give the same result? 5) The authors correctly claim that the MDC travels to the vacuole because they can see the cargo accumulate there in a pep4 deletions strain. However, without having a similar tool to see the trapped cargo (i.e. a peptidase knockout for each potential compartment) it might be premature to rule out that the MDCs do not travel to other compartments or might even fuse with the plasma membrane and allow deposition of cargo to the outside of the cell. 6) The idea of the MDC is very compelling, but EM data to describe its structure would be more informative (i.e. does it have a membrane?). This is a very well written and very interesting paper that describes a new pathway for the turnover of mitochondrial nutrient transporters that is distinct from classic mitophagy and may resemble the formation of mitochondrial derived vesicles seen in mammalian cells by McBride and coworkers – however this pathway requires mitochondrial fission. 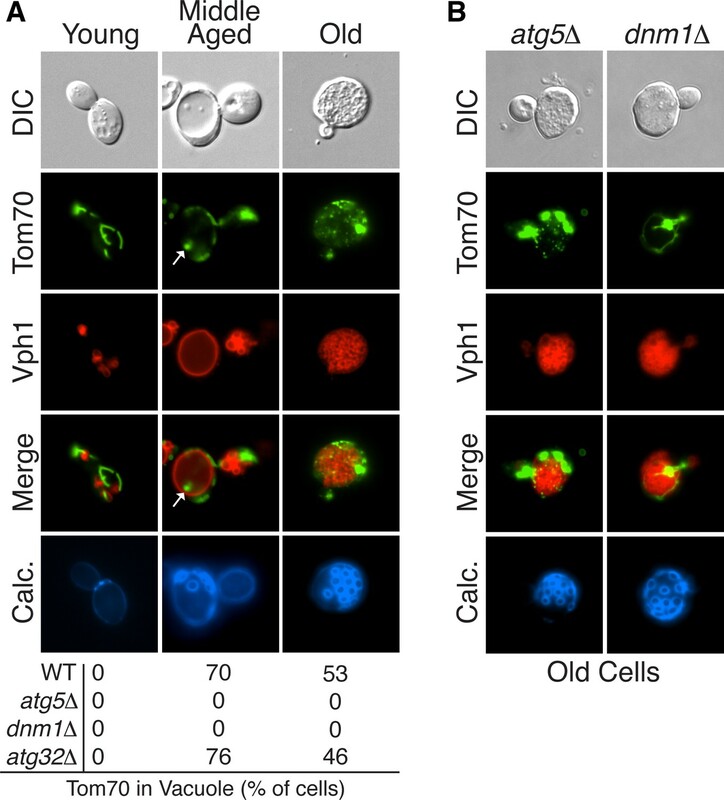 The authors have identified a select group of Tom70/Tom71 import substrates that are targeted to the vacuole upon loss of vacuole acidification or loss of mitochondrial membrane potential. Using a clever tagging approach they show that already synthesized and apparently translocated proteins participate in this process, implying that they may be organized by Tom70/71 after synthesis. The data are of high quality and the findings of broad interest that readers of eLife will very much appreciate. 2) Please comment on whether the levels of Tom70/71 and/or their substrates change upon vacuole neutralization or mitochondrial membrane depolarization. Overall, well done and so nicely presented such that non-experts can appreciate it. The authors identified a mechanism for mitochondrial outer membrane proteins and mitochondrial carrier proteins from the inner membrane are selectively removed from mitochondria in old cells and in all cells in response to loss of vacuolar acidity. 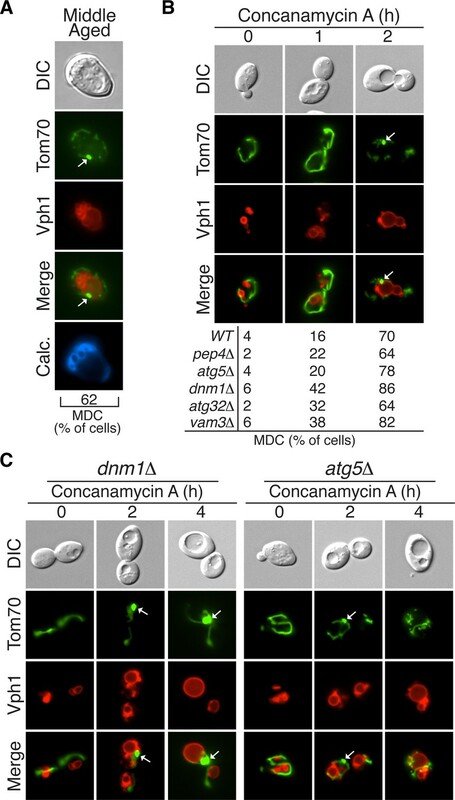 Protein removal occurs by DNM1- and Tom70/71-dependent formation of a mitochondria derived compartment (MDC) and ATG5-dependent but ATG32-independent degradation of MDCs by the vacuole. The authors also provide evidence that MDCs are distinct from MDV. The work is novel and of clear interest to the field. Major concerns regarding this work are outlined below. 1) The resolution of fragmented vacuoles and Tom70-GFP in Figure 1 is low. On the basis of the image shown, it is not clear that Tom70-GFP-containing punctate is excluded from fragmented vacuoles in old cells. Is there a decrease in PEP4-dependent degradation of Tom70-GFP to free GFP in old compared to middle aged cells? 2) The authors find that DNM1 is required for MDC formation. If the authors want to make the claim that MDCs are released from mitochondria by Dnm1-dependent mitochondrial fission, they need to provide evidence for a direct role of Dnm1 in MDC formation. For example, does Dnm1 localize to MDCs as they bud from mitochondria? 3) The authors also find that the ATG5 is required for degradation of MDCs by the vacuole, and propose that MDC degradation occurs by macroautophagy. If they want to make the claim that MDCs are enveloped in autophagosomes prior to degradation in the vacuole, they need to test whether autophagosome marker proteins are associated with MDCs and whether deletion of DNM1 affects this localization. 4) The finding that select proteins are excluded from MDCs in conc A-treated cells is interesting and important. A) Since mitochondria are generally more fragmented in old yeast compared to young yeast, it is not clear that the punctate Tom70-GFP-containing structures observed in old yeast are MDCs. Is Tim50 excluded from Tom70-GFP-containing structures in old yeast? B) To confirm that there is degradation of a select set of proteins in MDCs, it would be interesting to see if Tim50 is not degraded by autophagy in conc A-treated cells. 5) It is not clear whether tom70/71∆ cells are more sensitive to conc A because they have defects in protein import or defects in MDC formation. The text should be revised accordingly. 6) Although loss of vacuolar acidification does result in a decline in mitochondria membrane potential, it is not clear that the proteins that are removed in MDCs are dysfunctional. In fact, the authors speculate that MDC-dependent remodeling of mitochondria alters mitochondrial function in metabolite transport. Therefore, it is possible that the MDC pathway is not a quality control pathway, but a pathway for control of mitochondrial function. The manuscript would benefit from studies to distinguish between these two possibilities. For example, is loss of mitochondrial membrane potential or function sufficient to trigger MDC formation? Either outcome would be of interest to the field. In this paper, the authors report on the discovery of a new mitochondrial quality control system operating in yeast. They first show, taking advantage of pep4 mutant, that the mitochondrial protein Tom70 is degraded in old yeast cells by the vacuole in an Atg5-dependent manner indicating a role for autophagy in the delivery of Tom70 the vacuole. In addition, the delivery of Tom70 was abrogated in dnm1 mutant cells suggestion that fission from mitochondria is required for proper rerouting of Tom70 to degradation. It is further shown that loss of vacuolar acidity, which the authors have shown previously occurs early during mother cell aging and causes mitochondrial dysfunction, triggers the destruction of Tom70 via the route discovered. Prior to delivery to the vacuole, Tom70 congregated into large foci, named mitochondria-derived compartment (MDC) and this assembly of Tom70 was independent on both Dnm1 and Atg5. Most interestingly, MDC was then demonstrated to be specific for mitochondrial proteins lacking the cleavable presequence and the authors show that preexisting mitochondrial proteins (along with newly made ones) are targeted to MDC in a Tom70-dependent manner. 1) Concerning the requirement for fission. It is clear from the data that Fis1 cannot compensate for the lack of Dnm1 as the dnm1 deletion completely blocked Tom70 delivery to the vacuole. Nevertheless, it would be interesting to see if a fis1 deletion have some kind of defect also as Fis1 is required for proper localization of Dnm1. Also, as dnm1 deletion mutants display a defect in endomembrane trafficking one wonders if such effects could be part of the problem in delivering MDCs to the vacuole? Cannot come up with a simple genetic way/experiment to separate mitochondrial fission defects form endomembrane trafficking defects but the authors could perhaps comment on this. 2) In the experiments using conc-A to trigger loss of vacuolar acidity, the delivery of Tom70 to the vacuole is interesting for several reasons and one wonders if this could be discussed a bit further. First, loss of vacuolar acidity is effectively blocking endomembrane trafficking to the vacuole. Does this mean that the Atg5-dependet route is "immune" to such pH effects in the vacuole or does it indicate that MDCs are transferred from the mitochondria to the vacuole by a more direct route: mitochondrial-vacuolar contacts? The other interesting possibility (as the phenomenon is seen in old cells and during conc-A treatment) is that a loss of vacuolar acidity is, in fact, required for triggering the MDCs formation and delivery. Could it be tested perhaps if drugs affecting mitochondrial function but leaving the pH of vacuole intact can trigger MDC formation and delivery? In other words, approach the generality of the system discovered upon mitochondrial dysfunction. 3) It is stated that the formation of small vesicle-like structures (Tom70 associated) in the cytoplasm of old cells require mitochondrial fission (Dnm1) indicating that these membrane structures are derived from mitochondria. It is very hard to see these structures in the picture of the dnm1 strain – perhaps a better version could be added? Also, as the experiment uses Vph1 as a reporter, does not this indicate that the vesicle-like structures are derived from the vacuole (vacuolar fragmentation?) rather than formed by fission from mitochondria? At present, it is a bit unclear what these structures are, how they were formed, and how they relate to the MDC route discovered. 4) The authors suggest that MDC formation helps protect mitochondria from vacuole-induced stress as a greater loss in membrane potential is seen in tom70/71 mutants subjected to conc A treatment. Is it possible that this loss of potential in tom70/71 mutants could be related to other shortcomings than the formation of MDC? Also, did atg5 and dnm1, but not atg32, mutants display a similar loss of potential upon conc-A treatment? 5) Since aging is the entry port in this paper, I wonder if the authors could discuss briefly the possible significance of MDC in yeast longevity? As dnm1 and fis1 deletion mutants display a somewhat longer replicative lifespan, is it possible that a reduction in mitochondrial fragmentation (positive effect) in these mutants offsets the negative effect of an abrogated MDC response? Is the lifespan on tom70, atg5, atg32 mutants known? We appreciate the reviewer’s concerns that the MDC may be a collection of newly synthesized, unimported proteins, and we specifically discuss this possibility in the paper. However, several pieces of data in the manuscript strongly support the conclusion that the MDC degrades preexisting mitochondrial proteins. The first is the inclusion of cycloheximide in combination with the RITE tag experiment in Figure 6. As a control to address this point, we previously showed that MDCs still form in the presence of cycloheximide, which completely blocks all new synthesis of the RITE tag protein. Thus, the MDC is not formed from newly synthesized, unimported protein in this instance. In addition, outer membrane proteins that are MDC substrates do not require mitochondrial membrane potential for import into the mitochondria, and would not be expected to accumulate outside the mitochondrial under depolarizing conditions. Lastly, we have now included data in the manuscript as new Figure 3 (see question 2 below) that shows that loss of membrane potential is not sufficient to trigger MDC formation. If the MDC were simply a collection of unimported substrates, it would form under all mitochondrial depolarizing conditions that block mitochondrial import (e.g. loss of membrane potential), but we find that it does not. In response to the reviewers’ suggestion, we tested whether mitochondrial depolarizing agents FCCP and Antimycin A could induce MDC formation. We also tested hydrogen peroxide and amino acid starvation as well. All four treatments failed to induced MDC formation, suggesting the MDC is triggered by an unidentified signal originating from loss of vacuole acidity. The results from the FCCP, Antimycin A, and hydrogen peroxide experiments showing their impacts on mitochondrial membrane potential and structure but failure to trigger MDCs have been included in the manuscript as new Figure 3. The experiments addressing the role of ATG32 in the process were conducted in old cells or cells treated with concanamycin A to induce MDC formation, which are not conditions in which ATG32 has been previously implicated or tested. Our results show that ATG32 is not required for MDC formation, and the point of including this mutant is to show that the MDC pathway is distinct from the previously characterized Atg32-dependent mitochondrial autophagy pathway. In response to the reviewer’s suggestion, we performed experiments testing whether MDCs are constitutively formed in mitochondrial fusion mutants. We found that deletion of the fusion protein FZO1 does not cause MDC formation. However, the interpretation of this experiment is not straightforward, because loss of FZO1 causes yeast cells to lose mitochondrial DNA. Loss of mitochondrial DNA has previously been shown to interfere with vacuole-mitochondrial signaling (PMID: 23502676). Thus, although our results were negative, they may be complicated by the lack of mitochondrial DNA. Because of this, we did not include this data in the revised manuscript. We agree with the reviewer that there may be other fates of MDCs beyond the vacuole that we cannot visualize at this time. If other fates exist, they may be revealed in longer term studies. The text of the manuscript has been modified to reflect this uncertainty. We agree with the reviewer that EM data describing the MDC will be very informative. However, these studies are non-trivial to perform and while ongoing, have yet to be achieved. We believe that the present study already provides a great deal of support for an unexpected discovery as presented. 1) The authors refer to this pathway as a quality control pathway that degrades mitochondrial components from aged/damaged mitochondria, but since it also is induced upon loss of vacuole acidification, couldn't it just as well be described as a pathway to regulate mitochondrial function when nutrients are less available (and metabolic need is less) that is distinct from the Atg32 pathway? Please discuss and consider modifying text/Abstract/impact statement. We agree with the reviewer that the MDC pathway may not necessarily be a quality control pathway, but rather, a pathway involved in metabolic homeostasis. With the current set of data, we cannot exclude either possibility. As suggested, we have gone through the manuscript and modified our reference to the MDC pathway as a quality control pathway, and instead discuss it as a protein degradation pathway that responds to changes in the pH of the vacuole and modifies the mitochondrial proteome for reasons that remain to be determined. We would expect that the levels of these proteins would change under conditions of MDC activation because they are targeted for degradation and removed from mitochondria. However, as can be seen in the western blot in Figure 2D, the protein level of Tom70 (as an example) does not change. This lack of change in protein levels likely results from the fact that concanamycin A is used to induce this pathway, which ultimately also blocks degradation of the autophagosomes containing this protein in the vacuole (Nakamura et al., J of Biochem 1997). Thus, the total protein levels do not significantly change within cells, but we would suspect that levels of proteins within the mitochondria itself decline. It is not clear that this would occur with mitochondrial membrane depolarization, because as we now show in new Figure 3, loss of mitochondrial membrane potential alone is not sufficient to trigger MDC formation. 1) The resolution of fragmented vacuoles and Tom70-GFP in Figure 1 is low. On the basis of the image shown, it is not clear that Tom70-GFP-containing punctate are excluded from fragmented vacuoles in old cells. Is there a decrease in PEP4-dependent degradation of Tom70-GFP to free GFP in old compared to middle aged cells? Because the level of protein delivery to the vacuole in old cells is so low, we are unable to determine the Pep4-dependent degradation of Tom70-GFP by western blot as we conducted in young cells treated with conc A. However, we agree with the reviewer that it is difficult to ascertain in Figure 1A whether the small Tom70-fragments are within vacuoles or not in old cells. To address this issue, we have now included Videos 1–3, which show 3D reconstructions of old WT, atg5△, and dnm1△ cells taken with a DeltaVision microscope showing mitochondria (Tom70-GFP) and vacuole (Vph1-mCherry). As can be seen in the Video 1, the small Tom70-GFP punctae are outside of the fragmented vacuoles. These punctae are also present in atg5△ cells (Video 2), and are not formed in dnm1△ cells (Video 3). At the reviewer’s suggestion, we tested whether Dnm1-GFP colocalizes with Tom70-mCherry labeled MDCs, and found that Dnm1-GFP foci localize at or around MDCs in 88% of cells. This new data is included as Figure 4—figure supplement 1B. In response to the reviewer’s suggestion, we tested whether Tom70-mCherry-labeled MDCs colocalize with the classic autophagy marker GFP-Atg8. GFP-Atg8 localizes to the pre-autophagosomal structure (PAS) in yeast, which is near the vacuole surface and marks sites of autophagosome formation. We found that the majority (68%) of MDCs localize at or near the PAS. Those that did not were away from the vacuole surface. These results suggest that MDCs form at the mitochondria away from vacuoles, and then are recruited to the PAS to be engulfed by autophagy. This data has been included in the revised manuscript as Figure 4—figure supplement 2. We agree with the reviewer’s comment that MDC substrate selectivity is important, and indeed in our previous version of the manuscript, we do in fact show that Tim50-GFP is excluded from the MDC (marked with Tom70-mCherry) in aged cells (Figure 4B in original manuscript, now Figure 5C in the revised manuscript). We agree with the reviewer’s suggestion, and have now included western blot data showing that unlike Tom70, Tim50 is not processed by Pep4 in conc A-treated cells. This new data is included as Figure 5B. As the reviewer suggested, we added text to this section of the manuscript suggesting that the enhanced sensitivity to conc A in these mutants may be unrelated to their function in the MDC pathway. Reviewers 1 and 2 raised the same important points, and as suggested, we addressed these issues both experimentally and by changing the text throughout the manuscript. Please see our detailed response to these suggestions in Reviewer 1’s section, question 2, and reviewer 2’s section, question 1. Briefly, we added a new Figure 3 to the manuscript addressing whether loss of mitochondrial membrane potential or oxidative stress is sufficient to trigger MDC formation by treating cells with FCCP, antimycin A, or hydrogen peroxide. None of these three treatments resulted in MDC formation, suggesting that loss of membrane potential is not sufficient to trigger this pathway. We also agree with the reviewer(s) that the MDC pathway may not necessarily be a quality control pathway, but rather, a pathway for another type of mitochondrial dynamics/reprogramming. With the current set of data, we cannot exclude either possibility. As noted above, we have modified the manuscript accordingly to reflect this different view. The signal that activates the MDC pathway in response to changes in vacuole function is unknown, but could very well be metabolic in nature. At the reviewer’s suggestion, we examined the MDC pathway in strains lacking FIS1, and found that loss of FIS1 blocks MDC release from mitochondria and subsequent delivery to the vacuole, exactly as previously observed in cells lacking DNM1. This new data has been added to the paper as part of Figure 4—figure supplement 1. As the reviewer suggests, it is certainly possible that Dnm1 could play a role beyond mitochondrial fission in trafficking of the MDC to the vacuole. However, we feel that our new data showing that FIS1 is also required (which phenocopies loss of DNM1 and is not known to play a role in other endomembrane trafficking reactions), and that Dnm1-GFP foci localize around the MDC, strengthens the argument that fission is required for release of MDCs from the mitochondria. Thus, we chose not to include an extra statement regarding a potential separate role for Dnm1 in this process. We share the reviewer’s view that the role of vacuolar acidity in this process is very interesting, and that the mechanism of exactly how the MDC gets transferred from the mitochondria to the vacuole isn’t completely clear (most specifically, how MDCs get linked to the autophagy machinery). Our current data suggests that the MDC or pieces of it gets released from the mitochondria by fission, and then degraded by autophagy in autophagosomes. This suggests that MDCs follow a traditional autophagy degradation route to the vacuole through autophagosomes. In support of this, we added data to the paper showing that loss of VAM3 prevents the appearance of Tom70 within the vacuole of conc A treated cells. Vam3 is part of the vacuolar homotypic fusion machinery, and is required for fusion of autophagosomes with vacuoles. This data has been added to Figures 2 and 4, and strongly supports the conclusion that MDCs are engulfed by autophagosomes and delivered to the vacuole through the normal autophagy route. The reviewer raises the idea that conc A should interfere with endomembrane trafficking to the vacuole. While this is the case in mammals, this is not true in yeast. We added a brief discussion of this point in the paper, highlighting previous literature that shows that autophagosomes are delivered efficiently to vacuoles in the absence of vacuolar acidity (Nakamura et al., J of Biochem 1997). However, autophagosomes cannot be broken down in non-acidic vacuoles and accumulate there, and we see this in our assay as well. The other interesting possibility (as the phenomenon is seen in old cells and during conc-A treatment) is that a loss of vacuolar acidity is, in fact, required for triggering the MDCs formation and delivery. Yes, our current data supports the idea that loss of vacuolar acidity actually triggers formation of the MDC. This is most clearly illustrated in Figures 2B and 4C. In these assays, we show that blocking protein degradation alone, through loss of PEP4, does not causes accumulation of Tom70-GFP in the vacuole of young cells, nor does it cause formation of the MDC. Instead, the addition of conc A to these cells triggers both the formation of the MDC and accumulation of Tom70-GFP in the vacuole. Thus, this pathway is not constitutively on in young cells, and must be induced by a signal originating from loss of vacuolar acidity. We have added a sentence further clarifying this point in the revised manuscript. Could it be tested perhaps if drugs affecting mitochondrial function but leaving the pH of vacuole intact can trigger MDC formation and delivery? In other words, approach the generality of the system discovered upon mitochondrial dysfunction. This point has been addressed in our response to all three other reviewers above. Again, we now include data showing that loss of mitochondrial membrane potential is not sufficient to activate this pathway in new Figure 3. This suggests that loss of vacuole acidity is necessary to activate this pathway through an undefined signal. We agree with the reviewer that these structures are hard to see in the originally submitted manuscript. As addressed in response to reviewer 3’s comments above, we have now included Videos 1–3, which show 3D reconstructions of old WT, atg5△, and dnm1△ cells taken with a DeltaVision microscope showing mitochondria (Tom70-GFP) and vacuole (Vph1-mCherry). As can be seen in the Video 1, the small Tom70-GFP punctae are outside of the fragmented vacuoles. In regards to the reviewer’s question about the origin of the fragments (mitochondria or vacuole), we believe the reviewer may have gotten confused with the labels here. The fragments are labeled with Tom70-GFP, not Vph1, and are thus mitochondrial derived. Vph1-mCherry is included in the pictures, but marks vacuoles. 4) The authors suggest that MDC formation helps protect mitochondria from vacuole-induced stress as a greater loss in membrane potential is seen in tom70/71 mutants subjected to conc-A treatment. Is it possible that this loss of potential in tom70/71 mutants could be related to other shortcomings than the formation of MDC? Yes, we agree with the reviewer that the loss of membrane potential in the tom70/71 mutants could be unrelated to their role in the MDC pathway. We have now included a sentence in the manuscript addressing this alternative possibility. Also, did atg5 and dnm1, but not atg32, mutants display a similar loss of potential upon conc-A treatment? At the reviewer’s suggestion, we tested the membrane potential in these three mutant strains in untreated and conc A treated cells. We conducted this experiment by staining these cells with the membrane potential dye DioC6, and analyzing them by flow cytometry exactly as carried out in the paper. However, we found that all three of these mutants had membrane potentials lower than the WT strain even in untreated cells, which made the concA changes uninterpretable. Therefore, we did not include this data in the paper and instead added the qualifying statement mentioned in the point above. Following the reviewer’s suggestion, we have added a brief discussion of the lifespan point regarding the fission mutants and MDC in the discussion of the paper. Because dnm1△ mutants have an increased lifespan, we raised the possibility that the Dnm1-dependent mitochondrial fragments that form in old cells could negatively impact lifespan. The lifespan of tom70△ and atg32△ mutants has been shown to be longer than WT in dietary restriction conditions, but not necessarily normal growth conditions (Schleit et al., Aging Cell 2013). Lifespan data on atg5△ has not been published. However, two other strains lacking genes required for general autophagy, atg1△ and atg8△, have been shown to have an extended lifespan (McCormick MA et al., Cell Metab 2015). Based on all of this data, it is very hard to say whether the MDC pathway has any influence on lifespan. It may be the case the formation of the MDC is protective, and it doesn’t necessarily need to be degraded for protection. We thank members of the Hughes and Gottschling labs for helpful discussions and their critical review of the manuscript; Janet Shaw (Utah) and Jared Rutter (Utah) for helpful discussions; and Julio Vazquez and David McDonald (FHCRC Scientific Imaging) for assistance with imaging and software analysis for Videos 1–3. This work was supported by the Searle Scholars Program (ALH) and NIH grants AG043095 (ALH), AG037512 (DEG), and AG023779 (DEG). © 2016, Hughes et al. A previously unknown pathway can selectively degrade mitochondrial proteins in aged and stressed cells without destroying the organelle itself.